RAYMOND VAN BARNEVELD was eliminated from the Premier League following a crushing 7-1 defeat to Daryl Gurney on a difficult night for the Dutch legend in Rotterdam on Wednesday. 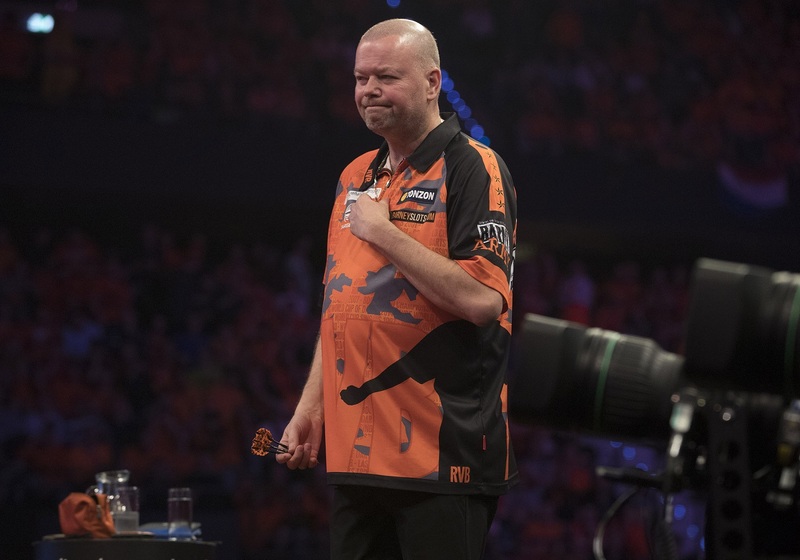 Former Premier League champion Van Barneveld needed at least a draw to prolong his hopes of survival into Thursday's Judgement Night, but came up short against Gurney, who put in a professional display in front of a partisan crowd at the Rotterdam Ahoy. Competing in his final Premier League before his retirement at the end of the year, Van Barneveld gave himself hope of escaping the drop with a win over Max Hopp in Berlin, but the five-time World Champion was unable to get near his best form despite the support of the 10,000-strong orange faithful. A series of well-timed finishes from Gurney condemned Van Barneveld to elimination for the first time in his 14-season Premier League career, while the Players Championship Finals winner marches on to a homecoming in Belfast on Night Ten. "It was a difficult game to play in the circumstances," said Gurney, who finished fifth in the 2018 Premier League. "Obviously Barney is a legend of the sport and he was playing in front of an incredible home crowd. "But I had a job to be done and that's what I did. I wasn't at my best by any stretch but in these kind of games all that matters is winning. "Now I can look forward to the rest of the campaign, and hopefully I can make the top four this time around. I'm over the moon to be returning to Belfast and I can't wait for that one." It was a better night for Van Barneveld's fellow countryman Michael van Gerwen, who soared back to the top of the table with a one-sided 7-1 victory over Peter Wright on the first night of the Dutch double-header. Four-time Premier League champion Van Gerwen suffered back-to-back defeats to Wright and Van Barneveld in Rotterdam in 2018, but wasted no time in making amends against the Scot with a 116 checkout to go 2-0 up. With Wright struggling to find his best form, Van Gerwen mercilessly punished the Scot to race into a commanding 6-0 lead to the delight of the Dutch faithful. After the world number one missed a dart for 7-0, Wright managed to avert the whitewash with double 16, but the reprieve was short-lived as Van Gerwen wrapped up a resounding victory on double 16. 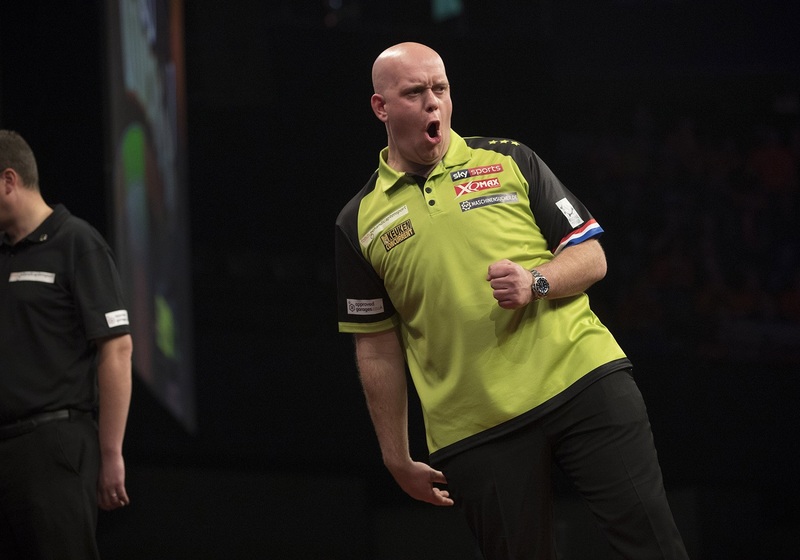 "It was really important for me to put on a show for the fans, especially after last year, so to win 7-1 felt really good," said World Champion Van Gerwen. "Twice this year I could've won 7-0, but 7-1 against Peter Wright is still a phenomenal performance. "I feel good, and there's more in the tank for the rest of the year. It's a great feeling to be back on the top of the league." Belgian prospect Dimitri Van den Bergh's Premier League debut saw him draw six-all with James Wade in a captivating contest which ended with ton-plus averages for both players. 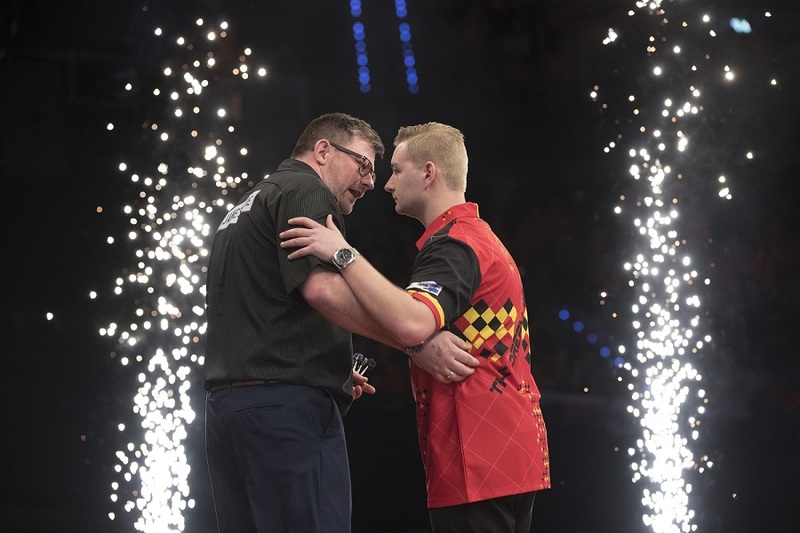 The eighth Contender to star in this year's Premier League, two-time World Youth Champion Van den Bergh got off to the perfect start and led 2-0 before a stoppage in play saw both players briefly leave the stage due to complaints of a breeze from Wade. Once play resumed, Wade got his first leg on the board before taking out a trademark 106 finish to level matters, but Van den Bergh hit straight back with two more legs, including a stunning 140 checkout, to restore his two-leg cushion. A resilient Wade came back from two legs down for the second time in the match, before a 121 checkout saw Van den Bergh move in front once again. Wade found his favourite double ten to take the next leg, but after he missed four darts to secure a point, Van den Bergh found the same target to go within a leg of victory, only for the left-hander to produce a strong final leg and earn a point which keeps him in the top four. "It was unbelievable and I enjoyed every moment," said Van den Bergh. "It's one of the greatest nights I've ever been involved in. "Maybe I'm disappointed to draw because I had my chances, but even though I didn't win I gained a huge amount of experience." A remarkable comeback from Mensur Suljovic saw him battle back from 5-1 down to claim an incredible 7-5 victory over Rob Cross, who had led the league table heading into Night Eight. Cross produced a masterclass of finishing in the opening six legs, finding the target with all five of his attempts at double, before a bizarre twist of events saw the former World Champion miss his next 11 darts at double. 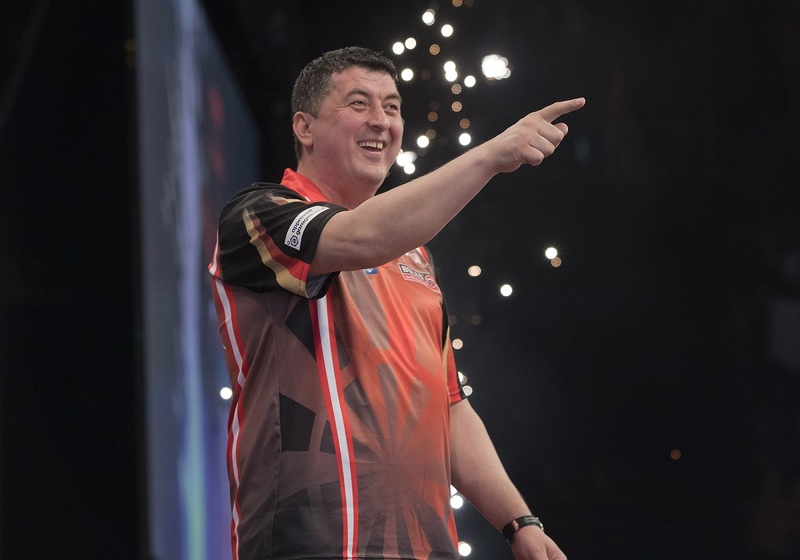 Seven of those misses came in the 11th leg, as Cross spurned the opportunity to secure a point, allowing Suljovic to steal the leg with a perfectly-timed 136 checkout, which he backed up with a 120 combination to claim an unlikely win. "It's a brilliant feeling," said Suljovic. "It was a hard game and to come from 5-1 down, I'm very happy. "Maybe 6-6 would have been the correct result - Rob played brilliantly to get to 4-0 and 5-1 but I thought maybe my chance would come." 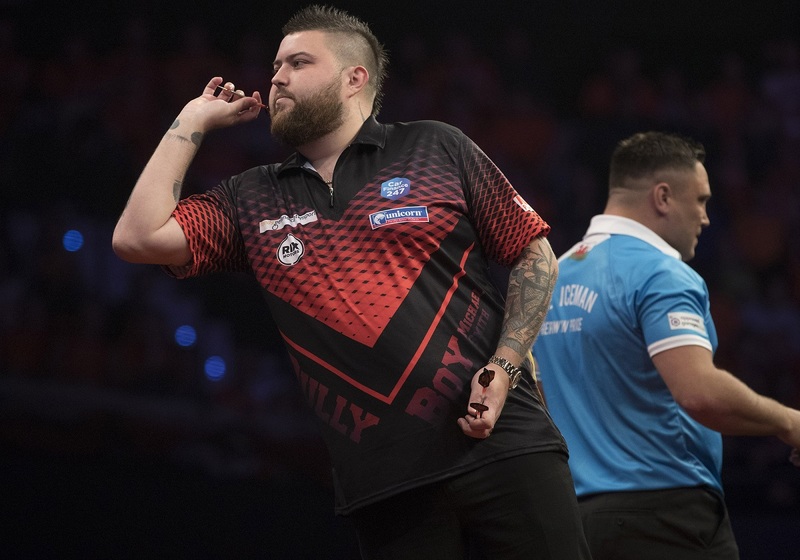 The opening game of the night saw Michael Smith boost his ambitions of a second successive appearance at The O2 with a hard-fought 7-5 victory over Gerwyn Price. After Price missed two darts for a point, 2018 finalist Smith pinned the bull with his last dart in hand for a dramatic 90 finish to take the win and keep in touch with the top four.